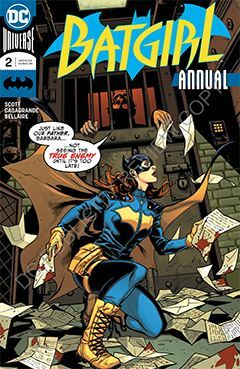 Batgirl is on the trail of a serial killer, and the trail leads to the door of James Gordon, her own brother. Yet a further complication is that said door is located in the bowels of Blackgate Prison, where he has been incarcerated for several years. Surprisingly, he’s willing to help, by sharing the various letters he’s received over the years from murder groupies. Perhaps the trail will lead somewhere, perhaps not – but Barbara has to try something. The story seems intended to build on the character of James Gordon Jr., perhaps setting him up for an eventual break-out and murder spree. But the story also showcases Barbara’s detective skills, which may be easy enough when a person has an eidetic memory. I would appreciate seeing more of her crime-solving ability, though that doesn’t always make for entertaining reading. I can appreciate the merits of this story as an annual, building significantly on the Batgirl universe and her supporting players. It needed the expanded format, though two issues in the regular series might have been more than it required.